As We Change Mistura's incredible 6-in-1 Beauty Solution® illuminating powder provides a natural luminosity and pearl-like finish to all skin types and colors. 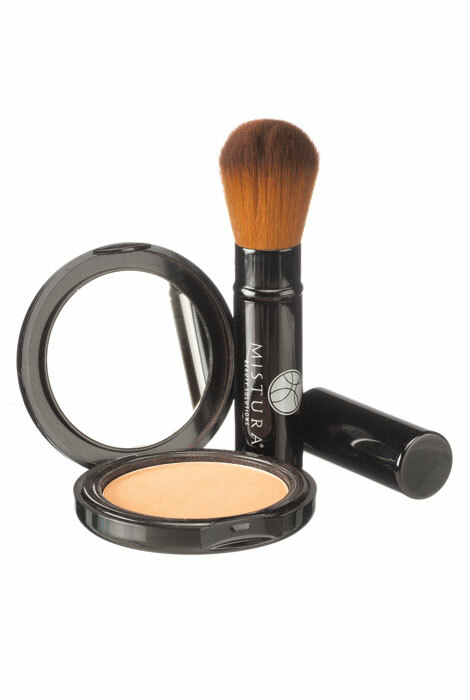 Blend this illuminating makeup powder into your cheeks, forehead, eyes and lips for an instant full-coverage glow. Our amazing formula will hide blemishes, mute rosacea, glide over fine lines and wrinkles and bring an instant brilliance to pale skin tones. On darker skin tones, the 6-in-1 Beauty Solution® creates a pearl-like shimmer and gives an instant air-brushed finish. A simply sensational beauty solution. 12 grams. A little Mistura goes a long way so application is key. Apply only a VERY SMALL amount of Mistura to your brush before you begin. Follow applications instructions included in your kit. Buff the 6-in-1 Beauty Solution® into the skin in a circular motion, starting on the outside of your face near your cheekbone and swirling as you go. Buff around your face and then your forehead, cheeks, and nose. Apply a moisture base to your lips, then Mistura powder to provide a lip color. My face has been going through some odd transformation... It actually looks better without makeup than with it! If you glance over and see my age you will know I've been wearing makeup for quite some time and going without won't be happening now! I like the mistura alone but I much prefer it as a blush over foundation. I was having trouble finding a new blush that looked right; but this has certainly done it for me. I even use it on my lips with Freshs' sugar over it. I am extremely happy with this product! your skin start to change. More product darker but too dark looks orange. It is meant to enhance your skin with a slight sun lit glow. I use it for eye shadow and under my chin around my neck. Price is high but it does last if used correctly. Love it!! I use this every day - either alone, for just an all over glow, or over makeup as a blusher. I use this product every day . I like very much because my skin is sensitive and this product is perfect . I am on my fourth compact. Really love this stuff - it's like a magic powder. I have never seen anyting like this before and love how easy it is to put on. This is the second time I have purchased this product and will probably continue to do so. It feels so good on the skin. Great product, but TOO pricy! I would recommend this product for effectiveness, but the price needs to come down! Made my skin break out with the first use. Did not add any color to skin. Doesn't self adjust as advertised. This product does not work for me. It does not self-adjust. It looks like a fake tan. After I read the positive reviews, I'd like to try the product. My wife liked the sound of what it will do saving time and effort. I thought it would be just what I needed. Less items to carry in my makeup bag. I am a repeat user of this - I love it! Sounds like a good products by the review. I like a natural looking glow on my face. I hope this delivers this! Like the idea that it can act as foundation and blush. Seems simple. I chose this because I read the reviews and it sounded like something I would like to use. It is multi-purpose and from the picture gives your skin a soft glow. Am extremely pleased with this product. A little pricey tho. looked like it may replace a foundation and loose powder. I've used it before and I love it. I'll take any help I can get! This sounds good. We'll see. What type of moisturizer underneath? BEST ANSWER: Thank you for your question. Any moisturizer can work underneath this solution kit. We hope this information will be of help to you. I use just my regular moisturizer and the Mistura goes on smoothly. will this product hide my dark spots on my face? How does it work for black skintones?